As a yogi, I love the beauty of every movement and every pose of the practice. My taste in art is similar. I love the story behind the image - unique to everyone who experiences it. I love flowing, colorful, magical works of art. There are few experiences that induce within me the level of bliss that I feel on the mat. I am about to share with you one of them. I became interested in Pop Surrealism when I first saw an enchanting, whimsical creature, created by artist Jeremiah Ketner. With his permission, I am sharing some of the paintings he has created that move and bewitch me the most. "Let's go for a swim" is one of my favorite paintings by Ketner. The serene, peaceful nature of the fairy-like human, and the surreal imagery and cascading images that surround her (including her beautiful red locks) make me feel a sense of peace and hope. Her bliss reminds me of that moment in Savasana when we TRULY let go. "All of my Dolls" instantly transports me to a safe place in childhood. 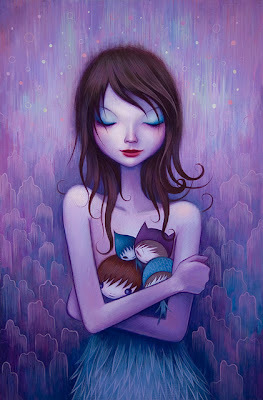 The young being is gently holding her dolls - not clutching them in a fearful or panicked way. She's collected them up and is cherishing and loving each one, grounding herself in the loving energy she feels from each. 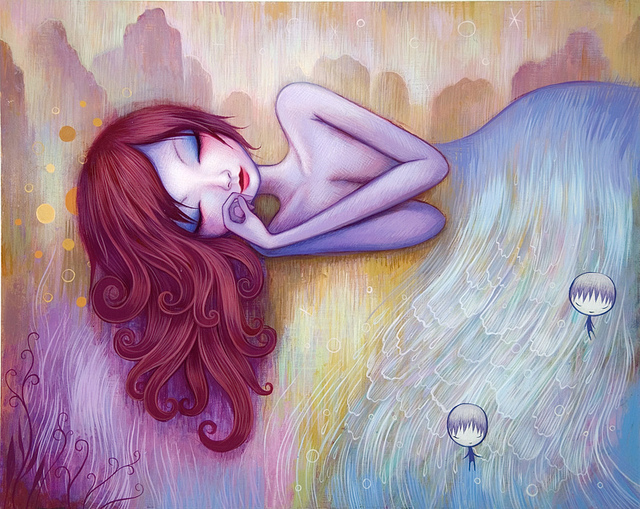 It looks as if she may be drifting off into a peaceful slumber with her entire collection of little friends. She is safe. All is well. This joyful image makes me smile. 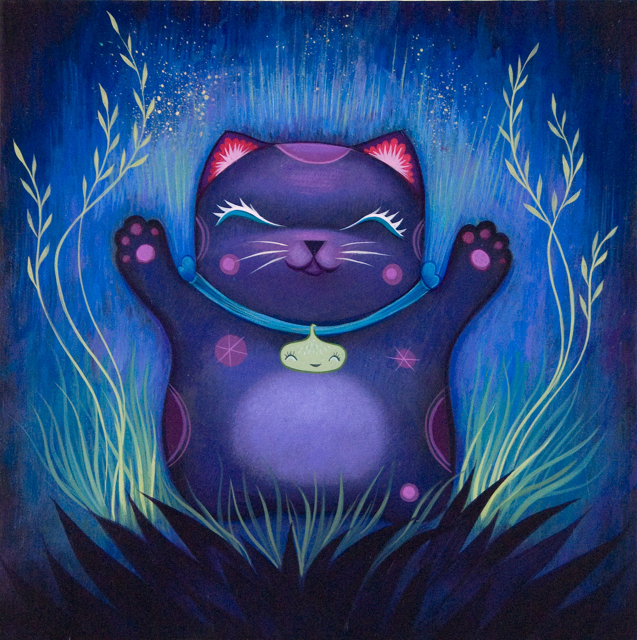 I love the deep violet colors and the energy light emanating from this Japanese kitty, a traditional symbol of luck on its way. All great art starts with an idea. 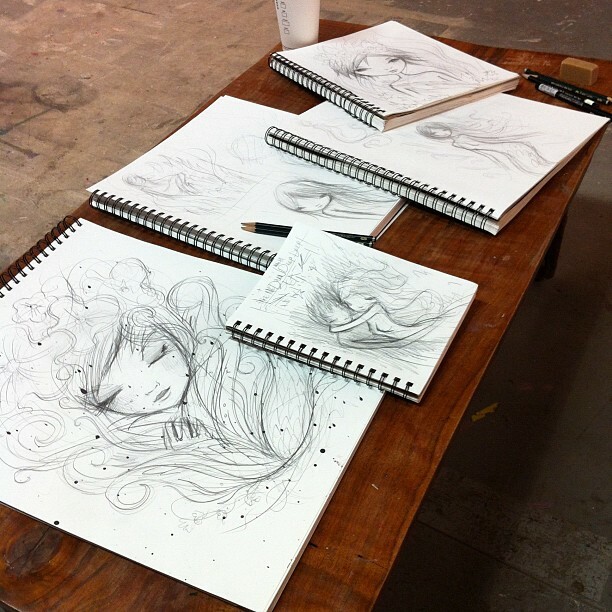 On Friday night, Jeremiah Ketner tweeted this lovely pic of his sketches. I am curious to learn which images move you and why. Looking at art and telling the story that comes up in your heart will be a unique, imaginative, and often healing experience. There is no right or wrong. You may not have been encouraged to use your imagination in a very long time. Watch how you feel during and after you allow yourself this experience. Jeremiah Ketner's response to this blog post on Twitter. First of all thank you for sharing this wonderful artist and his art, of his 2012 arts I loved 'entangled' & 'bathing in starlight'. His art is a visual treat and the reason I particularly loved (it was hard to pick:)) is because you could almost hear the women and their stories ! !..just amazing..